The Chinese Chongqing Dog originated in the Southwestern region of China 2000 years ago during the Han Dynasty. This unique and ancient breed were mainly owned by the elite for protection and as a status symbol. They are scent hounds and avid hunters of small game. They are extremely rare and very difficult to obtain. 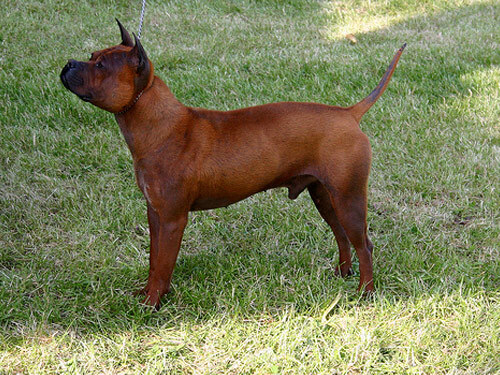 A medium-sized breed, the Chinese Chongqing Dog is strongly and squarely-built. They are powerful, muscular, and alert. The Chinese Chongqing Dog's are dignified and noble in appearance. The Chinese Chongqing Dog is not recommended for inexperienced or timid owners. They are natural guardians that possess a high drive. They are a primitive and evolutionary breed that were not developed through selective breeding. They are devoted and affectionate companions that do best in a home with older, considerate children. Chinese Chongqing Dog's are not recommended for homes with dogs or other non-canine pets. This breed is aloof and suspicious of strangers. They will not hesitate to defend their family, property, or territory. Due to the simplicity of the coat, the Chinese Chongqing Dog breed requires occasional bathing using a mild shampoo to prevent skin problems. There are no known health issues associated with this breed. They are not well-suited for cold climates. Flat, dense, short, harsh, and glossy. The Chinese Chongqing Dog requires a dominant and respectful owner. They will not respond to harsh, heavy-handed, or pain based methods. Early socialization and obedience is an absolute must. Training should be done with respect, firmness, fairness, and consistency. United States breeders of the Chinese Chongqing Dog will typically not sell to prospective families that reside in an apartment or condominium. This breed is not suited for city living. They require regular exercise and must have a securely fenced yard. The Chinese Chongqing Dog should never be allowed to roam off-lead in an unsecured area.